Gateway Visual Communications offers quality, large and small scale printing services to their clients. The company has over 30 years experience and was first established by Ross McConnell in 1975. The company’s main objective is to print documents in a timely manner tailored towards individual customer needs and adding the MultiCam Digital Express has helped Gateway satisfy this objective. Gateway has installed the Digital Express right beside their printer. The machine is equipped for applications such as sign & graphics, digital printing, packaging, automotive and more. It can cut a variety of materials such as acrylic, aluminum, leather, carpet, cardboard, foam, paper, vinyl, and fabric. 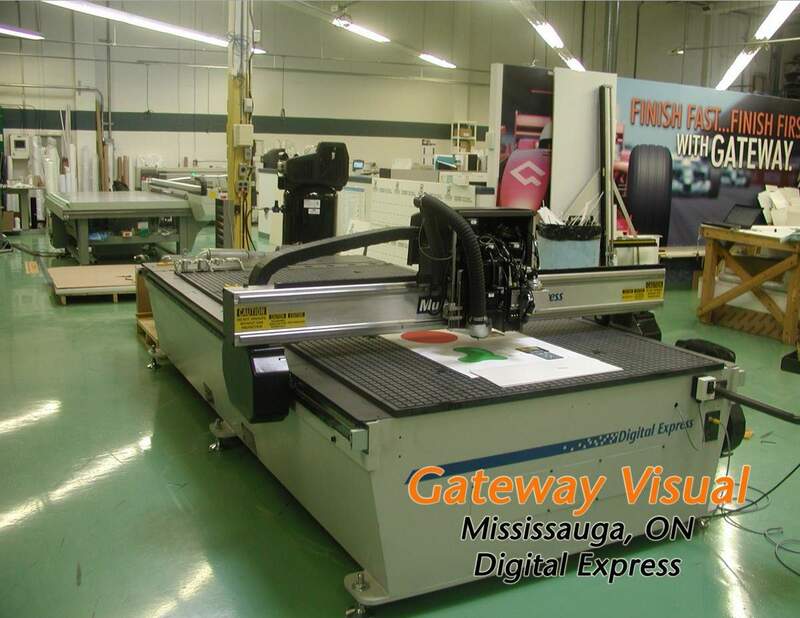 By placing the Digital Express side by side with the printer, Gateway has enhanced their flow of production as jobs progress from the printer directly to the MultiCam Digital Express for cutting. Through the elimination of bottlenecks they have taken efficiency to the next level. With fewer constraints in transition from one process to another, the business has realized growth in production capacity and Job accomplishment within a shorter time frame. An example of increased turn around time involved printing 11×17” counter cards. A colour laser system would be used as their old method of printing but this has proved to be a very labour intensive and slow process, printing a maximum of 20 cards per sheet. Using the Digital Express, Gateway received the job for 100 cards at 10:00a.m and finished before 4:00p.m in the afternoon. The VP of Operations Brian McConnell states how the machine is able to turn jobs around literally in hours. Jobs that would typically take 2-3 days can now be completed so much faster. Not only has Gateway been able to build productivity but also expand their business, taking on more complex and diverse jobs. For the first time they took on a caricature job, which involves the precise cutting of cartoon characters, a kind of work they have never done prior to the machine’s installation. With the machine’s MultiVision Digital Registration System it can visually recognize registration marks and automatically compensate for skew and image distortion allowing close cut performance with zero tolerance for bleed which the job requires. Gateway is able to go after larger jobs, satisfy higher demands and meet highly constricted time lines, all these opportunities they could not take advantage of without the machine.